These are all important parts of your marketing and well worth your time in planning, creating and execution. For the most part, these campaigns are designed to reach out to a cold audience and generate your initial leads. Over time, if you track and measure the performance of these different campaigns, you should be able to determine the most effective method so you know where to invest your future marketing dollars. Today we are talking about what happens AFTER the lead comes in – the so-called “back end” of your marketing program. 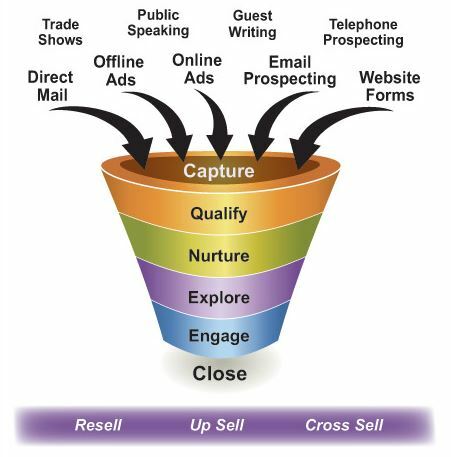 The sales lead funnel describes the handling of the sales lead that takes you from the initial lead capture through to the close. It used to be that this was the exclusive responsibility of sales. Marketing would create and execute programs that would generate the leads. As soon as those leads arrived, they would be tossed over to sales – and marketing would be out of the picture. At some companies, an inside sales team that would follow up with a phone call to qualify the lead and possibly schedule a meeting for a face-to-face sales call. And a sales rep would be sent out for that initial discovery meeting. This sales model is still in place today at many organizations. And still working pretty well. But now – thanks to technology – there is a better way. In today’s world, marketing stays active in the sales process long after the lead comes in. Sales remains involved, but now your sales reps stay focused on only the most qualified, sales-ready leads. No more prospecting. No more cold calls. No more chasing down low quality leads. And the best part is that much of this follow-up process can be automated. 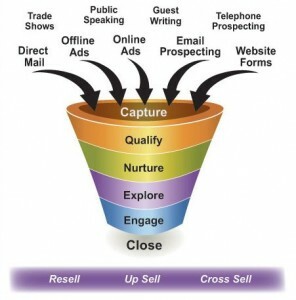 Before you start generating leads, make sure you have your sales lead funnel in place. While some leads may come in by phone or mail, the vast majority now come through the web – generally to a dedicated landing page. A landing page is better than your home page because it’s more focused on capturing the lead and has fewer distractions than your home page. The primary goal of every landing page is to convert that visitor into a lead. Don’t ask your landing page to do more than that. Remember you spent money (or time) to get that visitor to your landing page. Don’t let them slip away without anything to show for it. This is such an overlooked opportunity. You’ve captured the lead so the big job is done. You have their attention. Now it’s time to sell – or at least to nurture. Use your landing page not only as a platform for delivering the whitepaper or other offer, but as a way to get things started. Write a welcome letter. Provide an introductory video. Extend an invitation to a webinar. Offer additional reports or content. This the busy work of collecting the lead data, notifying the necessary players on your marketing and sales team and feeding the data to your CRM, marketing automation or email service provider. If the leads come through your landing page, it’s all automated. 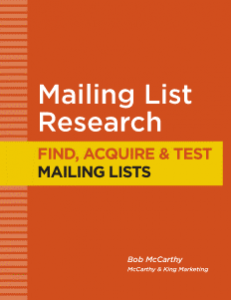 Leads that come via phone or reply mail will need some manual processing. Not all leads have equal potential for becoming customers – and lead qualification will help you sort this out. Lead qualification is a Q&A process. What is the real level of interest of each lead? Does the lead actually need what you’re selling? Does the lead have the financial capacity and decision-making authority to buy? When is a decision likely to be made? The phone works best here, but some early leads – especially from online marketing – may not be worth a phone call at this early stage. Alternatively, you can use online surveys to ask key qualifying questions. You can also use additional offers to request more contact information – and possibly match that information against publicly available databases to fill in missing data. To gauge lead interest, website visitor monitoring software can be used to identify leads that continually return to your website. Unlike the old days when all lead nurturing was handled by sales, you can now control your messaging and the pace of your messaging over an extended period of time. 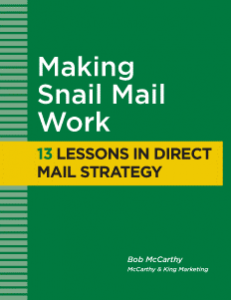 Email is the most cost-effective option. As new leads come on board, you can schedule them for a series of email messages to go out on a pre-arranged schedule. This is called drip email. 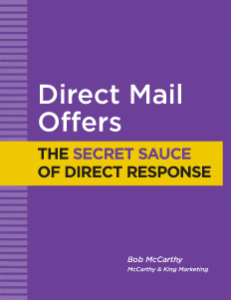 You can create multiple drip email sequences and send out the most relevant sequence for each prospect. 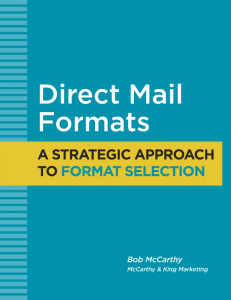 Direct mail reminders are still a good option – and given the shift toward email, direct mail now gets more attention than ever. But lead nurturing is not just about staying in touch. To do it well, you want a strategy that moves the prospects along in the sales process – and that can adapt to prospects at different stages in the process. This is not actually part of the sales lead funnel (it precedes the lead capture part of the funnel) but it merits discussion as a stay-in-touch strategy. Retargeting allows you to continually send online advertising to people who have visited your website but left without leaving their contact information. You don’t know who they are, but Google does and will continually feed advertising to them over an extended period of time. Facebook offers a similar program. Remember, most people who visit your website have some interest in what you do – even if they didn’t leave their contact information. It makes sense to stay in touch with these people. It’s easy to get overwhelmed by all of these components, but the good news is you just need one funnel to get started. Ideally, you would want to eventually create separate funnels for each product or service. Maybe additional funnels for each industry or market segment you serve. You may even have a separate funnel for existing customers – to cross-sell and up-sell additional products or services. But that can come later. Get your first funnel in place – and start prospecting.